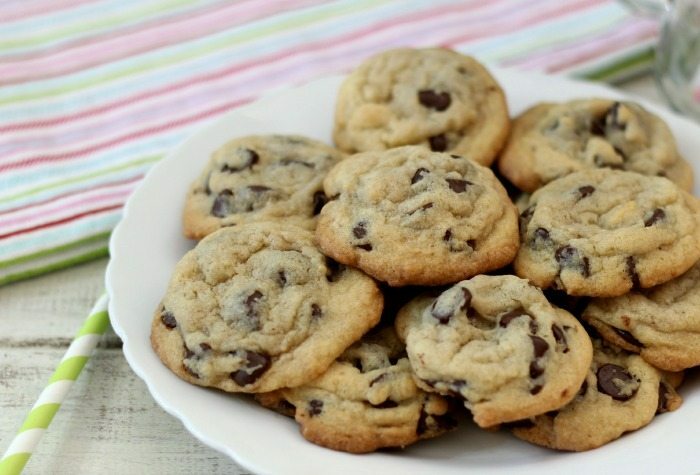 One thing I love is a good chocolate chip cookie. It is my all time favorite cookie and always brings back childhood memories of my Mom making them. 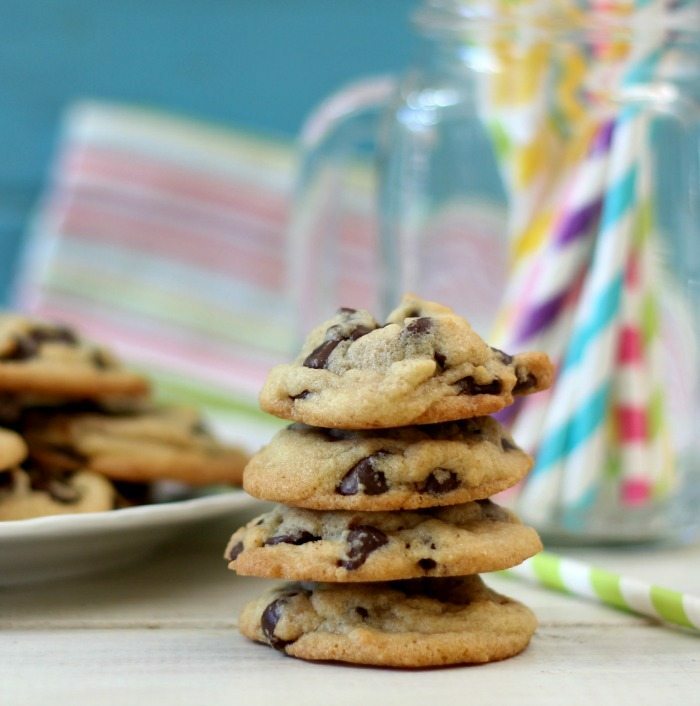 One thing about chocolate chip cookies is that all the recipes are pretty much the same with a few tiny modifications that can really change-up a cookie. I took my basic, most requested chocolate chip cookie recipe and made some changes and now I have a new chocolate chip cookie recipe. Let me introduce to you the newest cookie member to my collections; The Dark Chocolate Chip Chewy Cookies. These cookies have crispy edges, and rich gooey centers. Nothing beats a cookie when the chocolate sticks to your fingers. Yeah baby, that is what I am talking about. 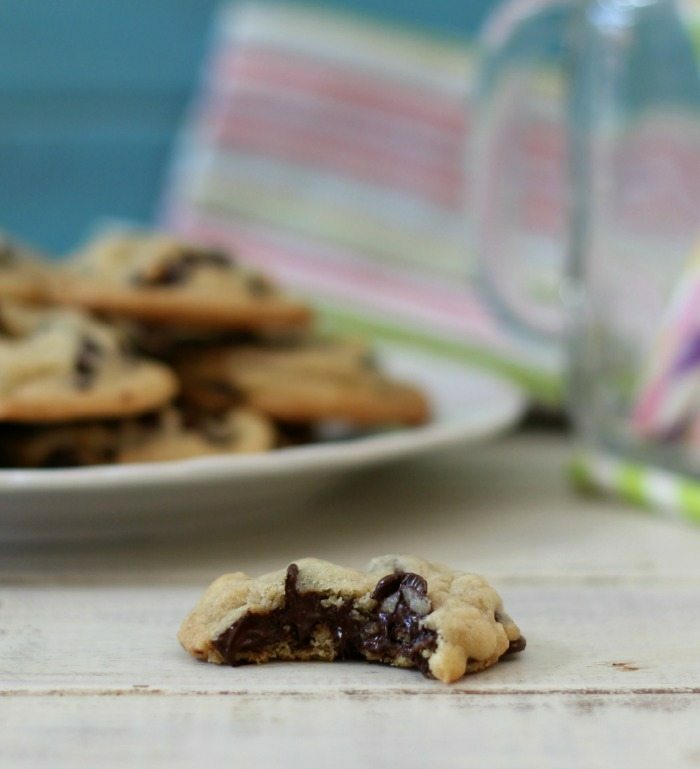 So if you love a soft, gooey cookie, these are the cookies for you. The changes that I made are pretty minor. The one thing I did which I normally never do, is sift my flour. I’m kind of lazy when it comes to it, but I did it to try it out, and what a nice change it made. It made the cookie come out nice and light. I also added a little more vanilla extract, because I am a vanilla freak. Actually I used vanilla bean paste that I picked up in Berkeley, but vanilla extract will give you the same results. One thing I did to save on calories is that I only used 1 1/2 sticks of butter instead of 2 and I also used 1 cup of sugar total. Most cookie recipes use up to 2 cups. That’s way to much. For the chocolate chips, I used Guittard Extra Dark Chocolate Chips because I am a dark chocolate freak. You can use semi-sweet chocolate chips too. Both would be great in this recipe. I’m kind of sad… I wish I made a double batch of cookies. Sigh… I already gave some to my Husband and to my co-workers. Now I have none for me. By the way this cookie recipe makes about 52 cookies. I ate some of the cookie batter, so I am sure I would have gotten more cookies. What is nice about these cookies is that they are only 83 calories each and they are so rich, you only need a couple. Not bad for a yummy chocolate chip cookie. 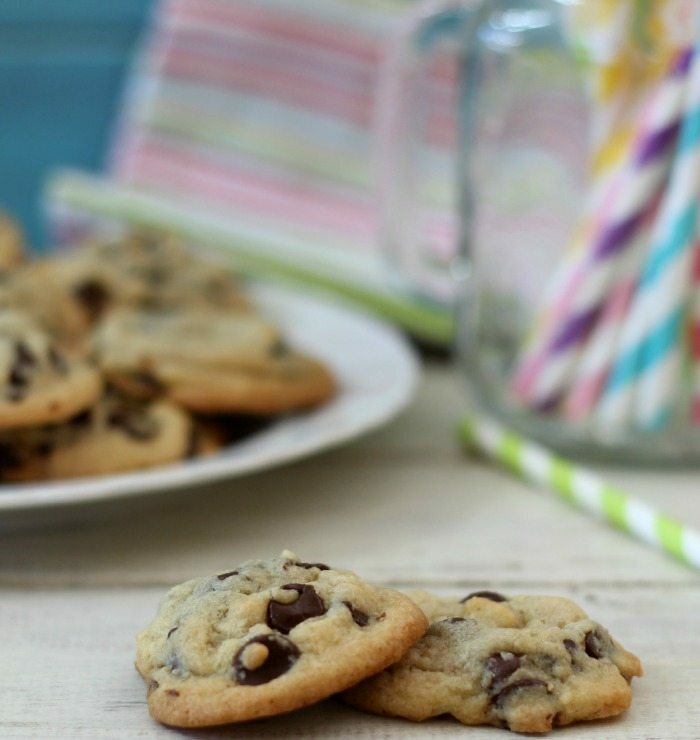 A dark, rich, chocolaty, gooey, chewy chocolate chip cookie made with extra dark chocolate chips. Only 84 calories a cookie. In a large bowl, add butter, granulated sugar, brown sugar and beat until creamy. Beat in one egg until combined. Beat in vanilla until combined. Slowly beat in the flour mixture until well combined. Stir in chocolate chips. I like to under bake my cookies to give it a gooey center. Just cook until lightly browned around the edges. I found 8 minutes was perfect amount of time. I have to admit I have really fell in love with baking this past year. It’s my favorite thing to do in the morning. It’s so much fun and even though I sometimes change-up a traditional recipe, it’s always fun to go a little crazy and try something new. What are your favorite things to bake? How delicious, Jennifer! I love that you used vanilla paste. Isn’t it amazing how a couple little changes like that, or sifting your flour, make such a big difference? I’m always shocked too as I can get lazy and not sift either :p Also, I love that you used dark chocolate chips. If you’re ever interested in another fun twist, I followed Deb from Smitten Kitchen’s lead and tried incorporating chopped up dark chocolate (like Trader Joe’s dark choc bar) into the cookie dough instead of using chips, and they just melted and became gooey in a way chips never do! It’s so yummy and I think is healthy like the dark chocolate chips are. Great post and beautiful cookies!! You know what I saw Deb’s recipe to chop up a chocolate bar. I have done that in cookies before, I so should do a big bar for chocolate chip cookies. Thank you so much for your kind words. Great recipe! I like less sugar and more vanilla. I added cinnamon because I can 😀 I will save this one for sure. Thanks. Awesome! These are one of my go to cookies. Less sugar in them is great, you don’t even miss it. Thank you for letting me know. 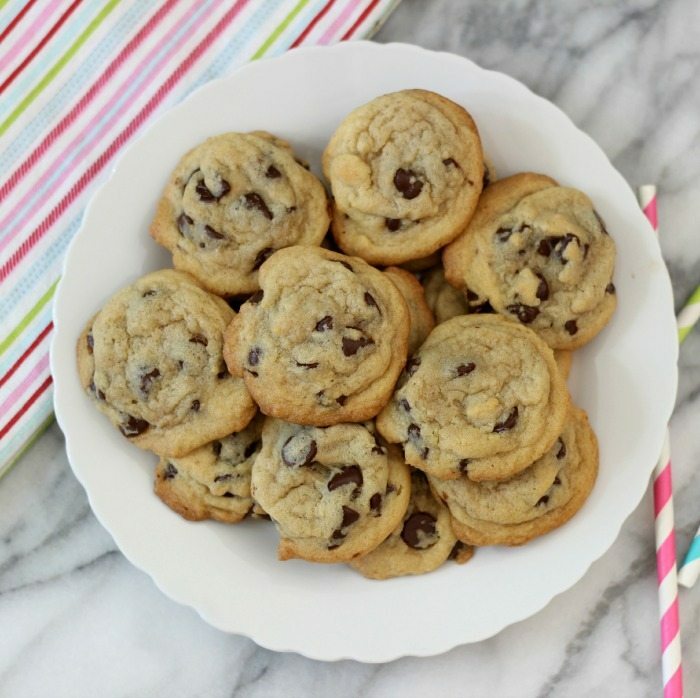 The cookies look so delicious and I can’t wait to try this recipe! 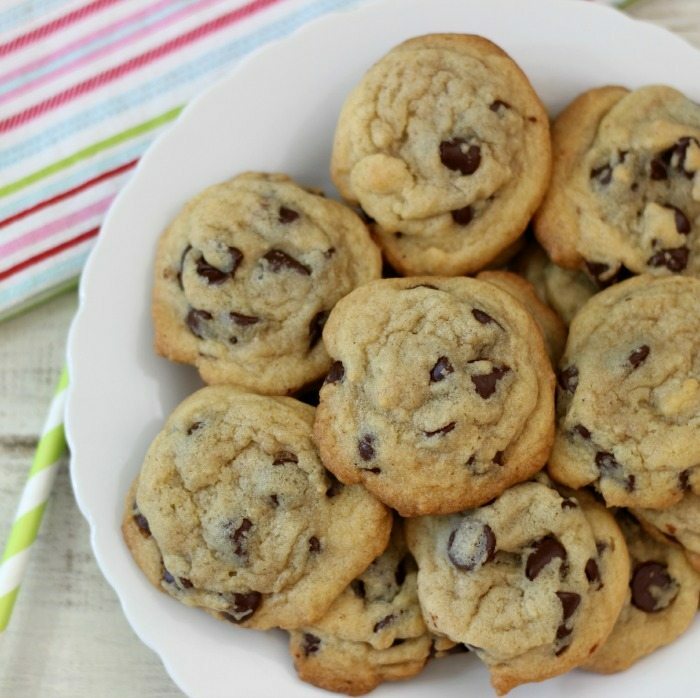 Quick question- can I use milk chocolate chips instead of semi-sweet and dark chocolate? I have a teaspoon size cookie scooper, and I like having more because they go so quick. You can make them bigger if you choose.